Congratulating the local Graduates and Course Participants, Dr Pickering pointed out that they were now equipped with an education from a world class institution and it was their responsibility to participate in and give back to their community. 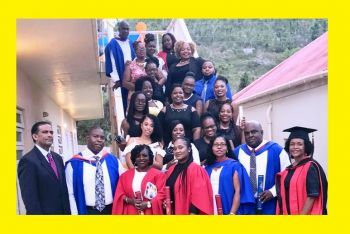 The Ceremony was presided over by the UWI Open Campus Manager for the British Overseas Territories, Dr Phyllis Fleming-Banks, who is based in Anguilla. In her welcome remarks, Dr Phyllis Fleming-Banks, said the ceremony was a fitting culmination of the hard work and sacrifices of the UWI Open Campus BVI’s seven newest graduates and the forty participants in the University’s 2017/2018 local Continuing and Professional Education (CPE) Programme. It was also testimony to the resilience of the people of the BVI and the other Caribbean islands that had endured the onslaught of Hurricanes Irma and Maria, she said. In her response on behalf of the 2017 Graduates, Ms Latoya Winter said, although the journey was a challenging one, it had transformed their lives and those of their families. Speaking on behalf of the CPE Course Participants, Ms Marsha A. Gumbs, highlighted the relevance of the professional development courses offered by the local arm of the UWI, and commended the staff and facilitators for their dedication and commitment to excellence. The celebration ceremony also saw the commissioning of the Executive Members of the BVI Chapter of the UWI Open Campus Guild of Students. Greetings also came from Alumnus Dr Ronald Georges, while Alumna, Mrs Celia Georges led the new Graduates in the UWI Alumni Pledge.